Greek police say they hit an Albanian-Greek gang of drug trafficking accused of importing large quantities of marijuana from Albania through Greece and further movement to Athens and other Greek areas and also other types of drugs such as heroin and cocaine. 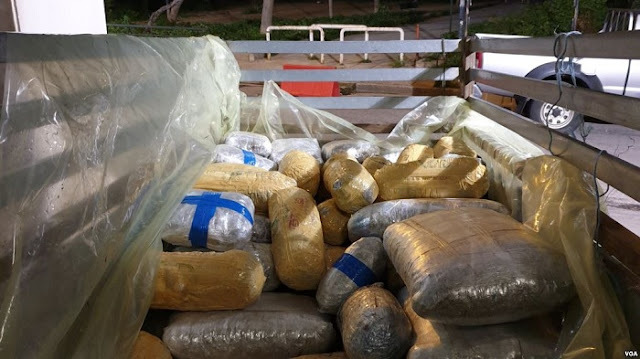 According to Greek police, a network of 21 people, mostly Albanians, since September 2018 had trafficked at least 500 kg of marijuana, 6kg of cocaine and 1kg of heroin, while the illegal gains may reach the amount of hundreds of thousands of euros. According to Greek police, among 21 members of the organization is arrested also a woman as involved in drug trafficking. Greek Police Representative Teodoros Kronopoulos said that "the entire activity consisted of a structured and continuous action group, in the form of a labyrinth of collaborative criminal network subgroups." According to the Greek official, "the imports of large quantities of marijuana from Albania to Greece have been made through Greek-Albanian land borders mainly at Thesprotia Prefecture. The Greek police official said "the traffickers used the temporary storage of marijuana in a predetermined place of Thesprotia near the Greek-Albanian border and then the transfer to Athens, with passenger cars loading narcotic drugs into the cart. Greek police said that in the same way are trafficked the cocaine and heroin, always using subgroups and storage space to move drugs both in the Greek islands and on the continent. The price of cocaine, according to pre-trial police investigations, ranged from 35 to 55 euros per gram, depending on the destination, quantity and interpersonal relationships between buyers and network members.